I heard a nice quote last week; "Multitasking is the enemy of focus." We all know it's bad, and yet many of us are stuck in a mode of trying to get too many things done at once. Times are tough, right? We just have to dog deep and get things done, right? An experiment was run observing people's ability to multi task procurement work for complex systems. This is roughly equivalent to managing the handover of requirements to a vendor or internal development team. People were observed working on 1, 5, 10 and 20 concurrent initiatives. And that's just to get the work order (aka specifications) shipped. Once you get a response the effort per task becomes even more complicated. Let me draw you a picture. Imagine the bars are project staff levels. What would you do? Jan A. Elfving and Iris D. Tommelein (2003) "Impact of Multitasking and merge bias on procurement of complex equipment"
i wonder about the type of activity that is measured here and if it corresponds over to my work as a BA. that's measuring work orders, a fairly repetitive task, but one that has to be done with much precision in a short period of time. BA work is, as i see it, a precise work over a much longer horizon than the duration of a typical work order. yes, i have noticed that when i have a dozen projects going (counting all the different systems i support and all the projects in their various phases i'm working on) that it becomes a lot more difficult to manage them all. it also gives me the opportunity to have my brain free associate between one project and another, which often leads to insights i would not have had were i not multitasking. 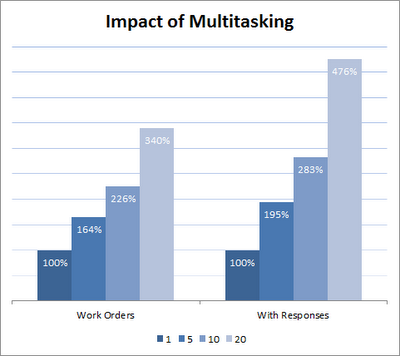 yes, in crunch time, multitasking kills. i do however see that it does provide me with some benefit in return. that may not be the case for everyone, but it is what works for me. The big question: Is anyone specifically measuring this in a project context? I'm not. I do measure what I can though and I have seen my personal productivity skyrocket when I kill concurrent activities and interruptions. Something I think I should have gotten into in the post is a definition of multitasking. For instance projects are made up of many discreet activities. It should be very feasible to manage many different project activities for many different projects in the course of a week as long as you are prioritizing and planning the work sufficiently. The problem is when you literally try to do many things at once; you begin one activity before you complete the other. Very interesting article. I am not sure if multitasking is detrimental or not. I use project management software to keep me organized (www.elementool.com). I complete my projects on time and I multi-task all the time. I think it depends on the person really. Totally agree with this. As a developer this is 100% true! Thanks Nick. I actually am well versed in Psychology ( have a masters) and have studied cognitive psychology for a bit. Humans are not designed to multi-task. Some are better than others though (it really depends on how powerful your working memory is). @craig just saw your reply. sorry i missed it before. anyway, i don't know of anyone who is specifically measuring it, but it would be interesting to see the results. part of the problem, as i see it in a project context, would be ascribing multitasking failures v/s project as a whole failures. that's a very difficult line to draw to say 'person A is responsible because of too much multitasking' v/s 'the entire project failed.' i think its an interesting thing to try and measure, but the large number of variables that a project would introduce would make this very difficult to study. Multitasking is evil, very very evil in all stituations and all jobs. I'm trying to aply pomodoro technique to my days :) is a working in progress but I'm doing some progress.